NASA counted down Saturday to the long-awaited launch of its latest Mars lander, InSight, designed to perch on the surface of the Red Planet and listen for "Marsquakes." The spacecraft was scheduled to blast off atop an Atlas V rocket at 4:05 am Pacific time (1105 GMT) from Vandenberg Air Force Base in California. Foggy weather was the only technical concern ahead of the launch, and NASA safety officers said Friday the usual visibility constraints might be waived so the launch could proceed. The $993 million project aims to expand human knowledge of conditions on Mars, inform efforts to send human explorers there, and reveal how rocky planets like the Earth formed billions of years ago. If all goes as planned, the lander should settle on the Red Planet on November 26. Its name, InSight, is short for Interior Exploration using Seismic Investigations, Geodesy and Heat Transport. NASA chief scientist Jim Green said experts already know that Mars has quakes, avalanches and meteor strikes. "But how quake-prone is Mars? That is fundamental information that we need to know as humans that explore Mars," Green said. The key instrument on board is a seismometer, called the Seismic Experiment for Interior Structure, made by the French Space Agency. After the lander settles on the Martian surface, a robotic arm is supposed to emerge and place the seismometer directly on the ground. The second main instrument is a self-hammering probe that will monitor the flow of heat in the planet's subsurface. The probe will bore down 10 to 16 feet (three to five meters) below the surface, NASA said, 15 times deeper than any previous Mars mission. Understanding the temperature on Mars is crucial to NASA's efforts to send people there by the 2030's, and how much a human habitat might need to be heated under frigid conditions, said Green. Daytime summer temperatures near the Martian equator may reach 70 degrees Fahrenheit (20 degrees C), but then plunge by night to -100 F (-73 C). "It is an important part of knowledge of how this planet is evolving," Green said. "We have to be able as humans living and working on Mars to survive that." The solar and battery-powered lander is designed to operate for 26 Earth months, or one year on Mars, a period in which it is expected to pick up as many as 100 quakes. "Hopefully it will last a lot longer than that," said Tom Hoffman, InSight project manager from NASA's Jet Propulsion Laboratory. The spacecraft was initially supposed to launch in 2016 but had to be delayed after temperature tests showed a problem with part of the seismometer, which engineers have since fixed. 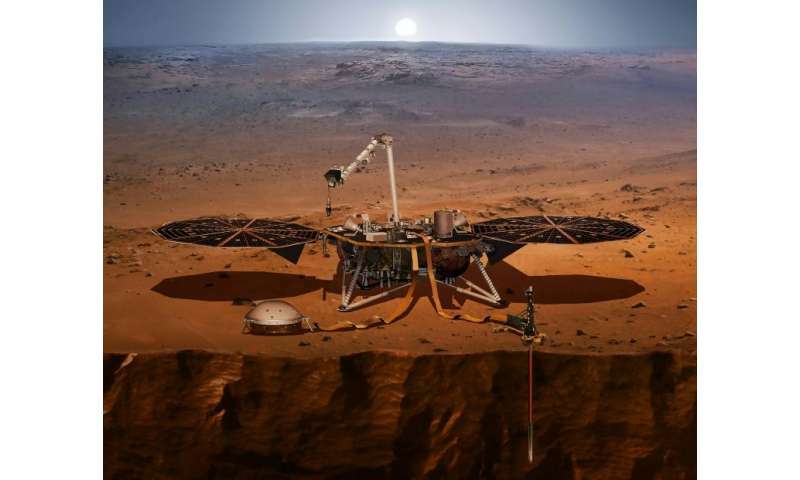 InSight aims to be the first NASA spacecraft to land on Mars since the Curiosity rover in 2012. "There is nothing routine about going to Mars, especially landing on Mars," said Stu Spath, InSight program manager at Lockheed Martin Space. "On Saturday morning, the anticipation and excitement is going to be second to none."